While some travelers flock to Midcoast Maine for the spectacular summer weather and abundance of lighthouses, others come to take advantage of the region’s incredible hiking trails. During your stay in Boothbay Harbor, one of the best ways to explore our coastal paradise and find relaxation in the beauty of nature is by embarking on a hiking adventure. 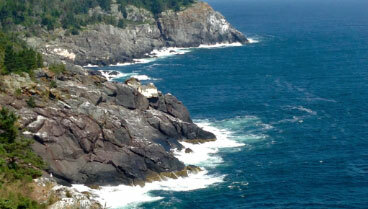 Here are just some of the most popular places for hiking in midcoast Maine that you’ll find near the Topside Inn. Hiking in midcoast Maine is just one of the many exciting outdoor activities in Boothbay Harbor. Request your free copy of our Vacation Guide right now for a full list of recommendations on local attractions, dining, entertainment, and more. The Boothbay Region Land Trust works tirelessly to preserve our area’s natural habitat and scenic beauty. 30 miles of hiking trails provide you with the opportunity to explore 18 different preserves, meadows, wetlands, and more. You’ll find a trail that fits any experience level, so any and all hikers can find the perfect adventure for them. Some of our favorite trails in the Boothbay Region Land Trust include the Ovens Mouth Preserve, Porter Reserve, and Lobster Cove Meadow Preserve. This historic, uninhabited isle off the coast of Boothbay Harbor is home to some of the best hiking trails in Maine. After a quick boat ride to Damariscove Island, visitors can enjoy 209 acres of coastal tundra vegetation, large populations of nesting seabirds, and three miles of hiking trails that allow you to see it all. 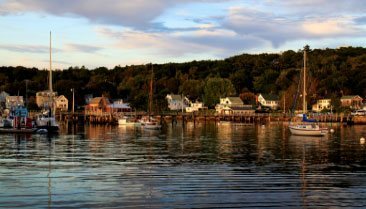 Another isle located off the coast of Boothbay Harbor, Monhegan Island is a local treasure with a thriving arts culture and abundance of natural beauty. The main draw for visitors is its awe-inspiring hiking trail that travels alongside wilderness areas, crashing surf, and stunning cliffs. After your hiking expedition, be sure to stop by Monhegan Island Brewing Company for a refreshing pint of Maine beer or browse the island’s wide variety of art galleries. Camden Hills State Park is a vast 5,700-acre wonderland of sweeping views and elaborate networks of hiking trails. These routes vary in difficulty and length, and most go up and around the mountains at a moderate incline. The views from Mount Battie and Mount Megunticook are well worth the trek, and hikers are treated to an incredible panorama of surrounding lakes, forests, and bays. 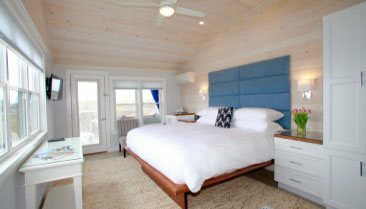 After a full day of hiking in Midcoast Maine, we invite you to come back to the Topside Inn for some well-deserved rest. Our gorgeous property is convenient to many outdoor attractions, including preserves, parks, and offshore islands. We also offer top-notch amenities and some of the finest accommodations in the area. 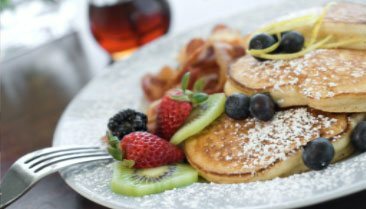 Plus, overnight guests are treated to a complimentary gourmet breakfast each morning of their stay. It’s everything you need and more for a memorable getaway to Boothbay Harbor. Book your favorite room with us today and we look forward to seeing you soon.